If you ever wondered what it would be like to be the only person (or only four people!) in the world, find out at MAK Villa. The St. Jean two-bedroom villa is designed for privacy with stone walls, tropical hedges, decorative entrance gates, and awnings. You have everything you need for a relaxing stay, including a fully equipped kitchen, gas grill, covered outdoor dining area, daily maid service (ok, so you are not the ONLY ones in the world), and entertainment options. Take a plunge in the pool or just laze the day away on a lounge chair. If you find you need a break from your secluded world, the beach, town, shops, and restaurants are just five minutes away. Come back and have a cocktail while enjoying the views of the bay and Ile Fregate from the terrace, open living room, or even your bedroom. Ideal for families and friends! 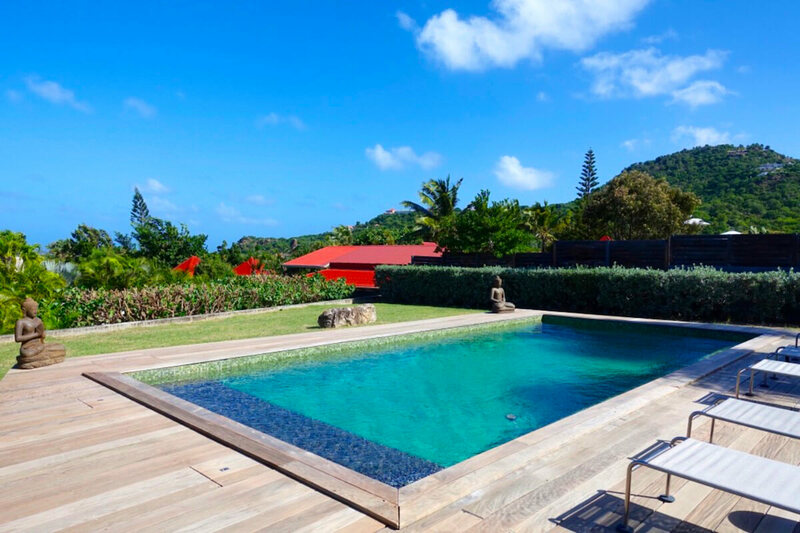 Villa MAK in St. Jean is a two-bedroom, two-bathroom villa with a pool, landscaped grounds, and views of Ile Fregate and the bay. It is a short walk to St. Jean Beach, shops, and restaurants. The villa has stonewalls and flowers in the entrance, an outdoor covered dining area, wooden terrace, pool, and lawn. Villa MAK offers lounge chairs. The well-equipped kitchen and the main villa open onto the covered dining area and views. Two air-conditioned bedrooms open to the deck and pool. These bedrooms have linens, towels, storage, and en-suite bathrooms. Shutters offer privacy. The air-conditioned main villa features sofas, modern-style furniture, flat screen TV, iPod, DVD player, and DVD movie collection. MAK is ideal for family or friends and is conveniently located in St. Jean. Short walk to St. Jean's beach! Welcome - 12 years and older, please.